It's from a chart by Pamela Kellogg. There is a small goof in the vines above the pumpkin - I put an extra space in and only discovered it way too late to fix it. Since it didn't really mess up the design (other than making the vine slightly more egg-shaped instead of round), I didn't bother to rip everything out. 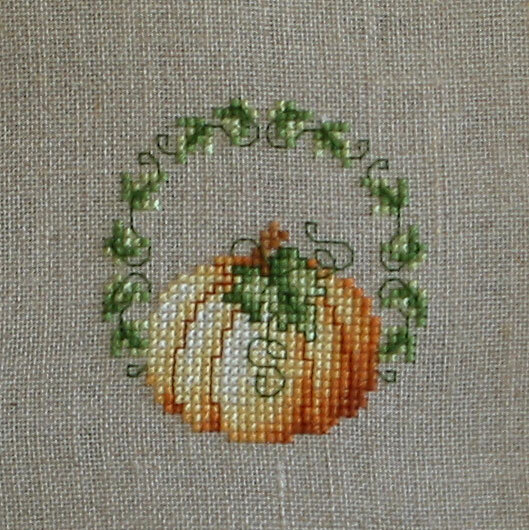 I also left out the "harvest" lettering since I'm hoping to find a cute charm or button, perhaps of a crow, to put in there. I started Halloween Fairy yesterday, but I'll wait until I get some more done before I post a picture. that is gorgeous!! I cant find that pattern on her site...am I overlooking it somewhere? I thought it was on her Flickr stream, but I can't find it there either, so I'm guessing she took them off. And of course, like an idiot, I deleted the file after I finished stitching it!